What can Privileged Membership do for you? Privileged Membership grants your firm or organization unlimited access to PLI's gold-standard programming and resources for one flat annual fee. We host hundreds of programs in dozens of subject areas every year – over 4,000 hours’ worth – so you can earn credits in the fields important to your practice; we also keep a vast online library of over 2,500 hours of On-Demand content. PLI is accredited to offer CLE, CPE (NASBA), CPD, CFE (Fraud), HRCI/SHRM and IAPP (Privacy) credit, among others. PLI keeps track of the credits you’ve earned and can submit certificates on your behalf. If you can’t attend our programs in person, we have many alternatives: we host Live Webcasts and Groupcasts across the country – with many new locations every year – and our iOS app lets you access programming from your tablet or phone. We’re proud to serve upwards of 330,000 users around the world, and that more than 98% of our Privileged Members renew every year. Our community includes more than 50% of the Fortune 500 and 96% of the Am Law 100. Each PLI partner has a designated team to help maximize the value of their Membership. Want to learn more about Privileged Membership? Unlimited access to world-class training and resources for ever current continuing legal and professional education. 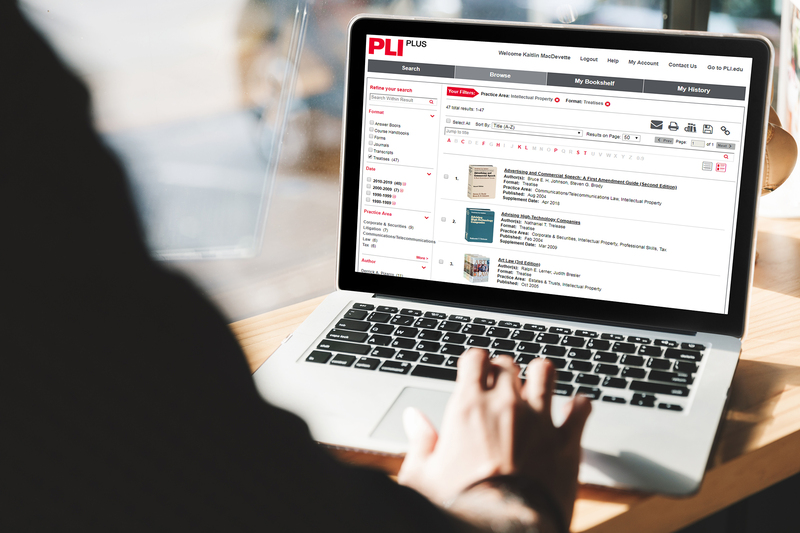 PLI PLUS offers unlimited electronic access to the full text of all PLI Press publications — totaling more than 4,000 titles. This vast library includes our treatises, Course Handbooks, Answer Books, and journals — a wealth of content that provides current practice skills knowledge from expert practitioners in the legal field. The platform also grants full access to state and federal cases cited in PLI titles, powered by Fastcase.